Sometimes life leads us through dark and desolate places, without promise of resolution. It can feel as though our trials are unending, piling one on the other, while we’re expected to shoulder the whole, growing burden. And when we find ourselves at the center of such a storm, it can be impossible to envision a way out. When we meet others who are paralyzed by such circumstances, our best hope is to show them by our actions that they are not alone, and help shine a light on the path to healing. 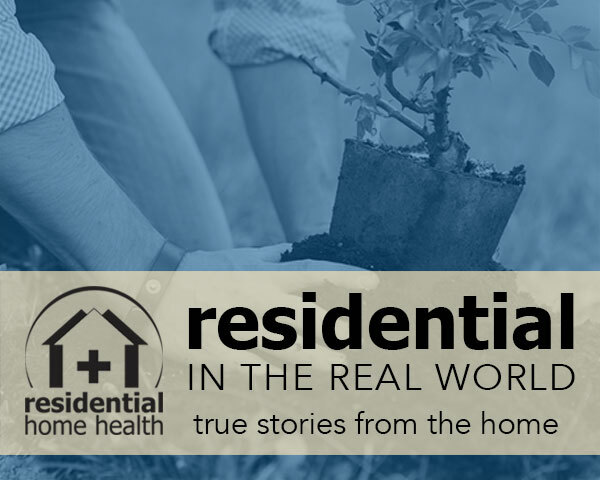 Read on to discover how Kaye, a Medical Social Worker and Residential Home Health Therapy Preceptor, helped a grief-stricken patient and her family find peace and uncover resources to make the journey ahead less painful. Kaye’s patient, a married woman in her 20s with two children, had recently suffered a difficult pregnancy and stillborn delivery. During her pregnancy, the patient experienced severe fatigue and uncontrollable muscle activity, and when the symptoms remained after pregnancy, further testing led to a diagnosis of multiple sclerosis. Such a difficult diagnosis would have a significant toll for any individual, and indeed, the patient felt lost and uninformed about her condition and the resources available to her. Added personal strains only increased the patient’s struggle to cope. Because her condition did not permit her to work or continue with schooling, the family’s finances were stretched thin, and the money raised to help with funeral costs was instead needed to pay the mortgage. Without a funeral service, the stillborn baby’s ashes were not laid to rest, and the patient and family were unable to sufficiently grieve. Once Kaye was involved, she immediately contacted the National Multiple Sclerosis Society to register the patient for emergency monetary funds and obtain additional resources and information; she also reached out to a local agency for continued support. Next, Kaye turned to the Veterans Association, requesting funding for which the patient was eligible based on her past military experience and honorable discharge. In time, these efforts helped easy the family’s financial burden, one step toward focusing back on the patient’s care and health. Kaye also wanted to address the patient’s fractured emotional state after such a shattering recent loss, and do everything she could to help facilitate the healing process. First, she began a conversation about holding a funeral for the stillborn child; the patient was receptive and expressed her hope to keep the service small. She also stated a wish to have a tree or plant at home as a living memorial. During their discussion, Kaye suggested that the patient write a letter, expressing the anticipation, hope, and love the family had felt for this child — ultimately, this letter was laid to rest with the baby’s ashes. Finally, Kaye found a local nursery willing to donate a flowering tree to the patient and family; with a helping hand from a colleague, she personally delivered this heartfelt memorial to the patient’s home. Although this patient’s health challenges may continue, Kaye’s compassionate actions helped to lessen the family’s unbearable practical and emotional stresses. With the grieving process moving forward and critical resources and support in place, this patient and her family are better equipped to face whatever successes and setbacks lie ahead.